I’m not going to bore you with the taste of cocoa, coffee and avocado because all pallets are different. Now if you want a beautifully made cigar, With thick oily smoke and loads of long lasting flavor, step right up. If you’re an once in awhile smoker, you may want to ease onto this one. It does pack a punch!! I've smoked some great cigars but this cigar is, for me, what a cigar should be. Well done JDN!! This is one of my favorite everyday smoke. Female cigar aficionado here fellas; This stick is over the top, an IMPECCABLE smoke. Flawless construction, long-flowing draw and frankly, the sexiest ( for fabulously rolled tobacco) and exponentially intoxicating cigar. It's bold and dreamy character makes it a keeper. Highly, highly recommended. Many thanks to BCP for this sampler. Great burn, ash, char, draw and taste. 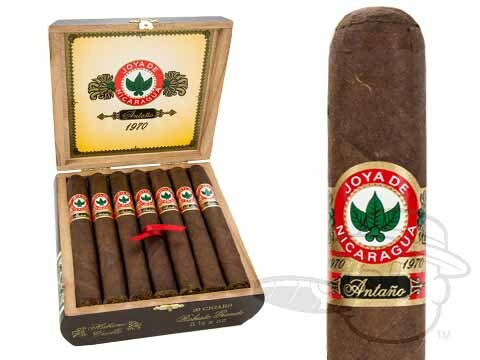 JOYA de Nicaragua Antano 1970 Robusto Grande is rated 4.7 out of 5 based on 8 customer ratings.